With 1:09 left in the game against then 4th-ranked LSU, A.J. Green leapt to make an improbable catch and put the Georgia Bulldogs (3-2, 2-1 SEC) up 13-12. Green jumped up and was ecstatic. He pounded his chest with his fist and pointed to the a student section. He did not appear to be taunting anyone on the LSU team or bench. But he did get an unsportsmanlike conduct penalty for "excessive celebration." How bad was this penalty? Bad enough it put Georgia into a deep enough hole to set up perfect field position for LSU to score the winning touchdown with 46 seconds left in the game and salvage their perfect record. After the game ended, the UGA North Campus and downtown Athens was relatively quiet, as one would expect after a heart-breaking home loss. But the radio lines were not quiet. "The celebration penalty was only put in place to put restraints on black players." Thanks heavens Johnston stepped up and said he was not even going to give any credence to such and outrageous statement with any kind of response. 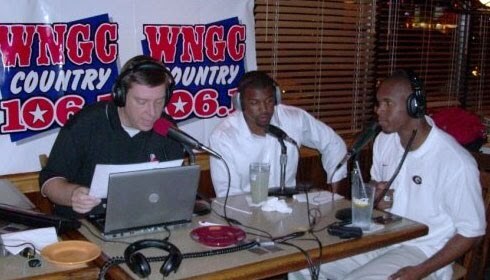 Co-hosts AJ Bryant and Kelin Johnson also declined to take on, as one of them called it, the "race card." One has to wonder if this is the type person who searches Google wanting to know if NBC Sports/Raycom Sports play-by-play commentator Tom Hammond is white or black. This rule has nothing to do with race. It has everything to do with stupidity when a player or team goes overboard in celebration. A perfect example is when Georgia stormed the field two years ago after scoring against Florida. The call made last yesterday against Georgia, as well as the one called against LSU when they scored 23 seconds later, was absurd and should never have been called. NCAA Football Rule 9-2, Article 1(a)(1)(d) prohibits "Any delayed, excessive, prolonged or choreographed act by which a player (or players) attempts to focus attention upon himself (or themselves)"; in addition, Rule 9-2, Article 1(a)(2) asserts that "After a score or any other play, the player in possession immediately must return the ball to an official or leave it near the dead-ball spot." Additionally, if a player's actions is considered "unsportsmanlike conduct" the result is dead-ball foul; a "flagrant unsportsmanlike conduct" foul requires player ejection. If a player’s nonfootball-related act (e.g. taunting or cursing) causes an opponent to physically retaliate, it is considered fighting and both players are ejected. To have a game decided by a (poor) judgment call on the part of the officiating crew is just wrong. It is most certainly not racist. Is that the way the Southeastern Conference wants to conclude its marquee game of the week, pitting the Nos. 4 and 18 teams in the nation? With its referees having to provide a postgame explanation for why they micromanaged an exciting game with a seemingly oversensitive celebration call? Here, by the way, is the initial explanation provided to Georgia: "The excessive celebration penalty following Georgia's final touchdown was called on receiver A.J. Green, who caught the scoring pass." Thanks for clearing that up, fellas. Only after reporters persisted in asking for a better explanation did they offer: "Following a brief celebration, Green made a gesture to the crowd calling attention to himself." Seriously? Let's break out the slow-motion Zapruder film showing Green's touchdown celebration. "Here's the gesture. See his hands moving slightly? Back and to the left." God forbid Green get excited for scoring a highlight-reel touchdown with barely more than a minute to play against the No. 4 team in the country. This isn't tiddlywinks, after all. Green's celebration was hardly excessive nor demonstrative given the time remaining and the circumstances involved. I'm not a rip-the-referees kind of guy, but the SEC needs to rethink this rule. The league has apparently overlegislated the fun out of the game. Football is an emotional sport and a player should enjoy his moment when he makes such an important play, as long as he is not overtly disrespectful - and Green was not. Rudy, there is nothing racist behind the rule. So please stop trying to pull the race card on something as insignificant as this and save for for when something is really important AND clearly the result of racism. A.J. Green touchdown catch photograph by John Kelley. 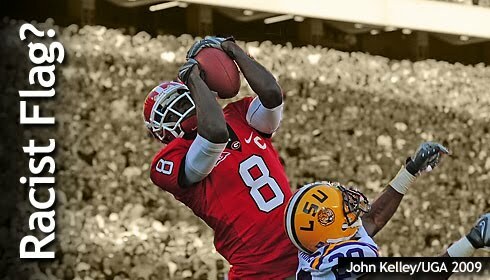 Courtesy of UGA Sports Communications.